The parliamentary libraries of the world, as a distinct type of librarianship, form a Section of their own within IFLA. This Section (Section 03) belongs to the Division of Library Types (Division I). The purpose of the Section is to apply the general objectives of IFLA to the particular situation of legislative libraries, the national legislatures in the case of unitary states and both national and second-tier legislatures in the case of federal countries. Parliamentary librarianship is a distinctive form of information work, mainly for Members of the Legislature, who work under great pressure, and who both use and create information. For this reason they need adequate information support. In the last twenty to thirty years there has been a great growth of this work, not just in terms of quantity, but in many legislatures in terms of quality and depth also. Research services have sprung up, and other specialist services such as economic modelling. Whether these come under the Library or not depends on the administrative structure of the legislature. But all forms of information for legislators and also any personal staff they may have is of interest to the Library and Research Services for Parliaments Section. To encourage the establishment of regional groups of parliamentary libraries like the European Centre for Parliamentary Research and Documentation. A particular aspect of the Section's work is to promote cooperation between legislatures and especially their libraries & research services because of the growing need for legislators to be well informed concerning developments worldwide. The Section's work is overseen by a Standing Committee which, in turn, elects the Section's Officers, i.e. the Chair, Secretary and Information Coordinator. IFLA holds meetings throughout the world once a year at which the Section presents a programme of papers for an open session, sets up a workshop on a particular theme and usually holds a pre- or a post-WLIC meeting lasting two days or so. These meetings are often held in connection with the legislature of the host country. IFLAPARL2 list is a discussion list open to all members of IFLA Section on Library and Research Services for Parliaments and those attending the Section's activities. Information about the Section's pre-conferences and conferences will be distributed on this list. 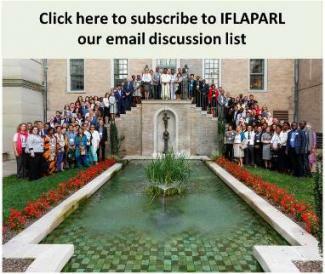 Note: IFLAPARL is a closed list (you must subscribe to it before you will receive emails. Either members of the Section or those interested in the work of the Section may subcribe). Enquiries on the Section's publications should be addressed to the Secretary.